We are pleased to announce that Mildred Solomon, president-elect of The Hastings Center, will join the Bioethics Bootcamp as moderator of the keynote session, Why Bioethics Matters. Read more about Dr. Solomon here. Don’t miss this opportunity to hear three Hastings Center presidents speak. Register now if you have not done so yet. We regret that we are unable to accept walk-in registrants. 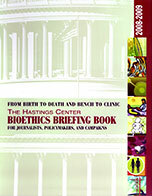 ← Bioethics Bootcamp is nearly sold out — register now!